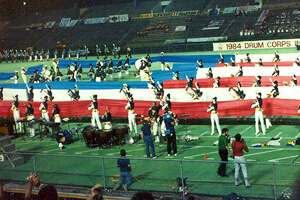 From the northernmost location in 1982 in Montreal, to the southernmost in 1983 in Miami, the Drum Corps International World Championships stayed south in 1984 heading to Georgia Tech University's Grant Field in Atlanta. After becoming the east's first DCI Champion in Miami, the Garfield Cadets topped Blue Devils by just a tenth of a point at the 1984 Finals to give the corps 76 wins over two consecutive seasons, which remains a record. The Cadets were not undefeated, though, losing four shows in '84 to three different corps; Phantom Regiment, Santa Clara Vanguard and Blue Devils. The 1984 World Championship was also the first to welcome Velvet Knights into the top-12 and the first to see a majority of finalist corps break 90 points to close out the season. Suncoast Sound's 7th place show started with staff composer Robert W. Smith's original "Six O.S," which reflected the turbulence of the 1960s. The title of the opener was a double entendre, said to stand for both "60s" and "S.O.S." The piece began much as the decade did in America, with boisterous optimism, prior to a number of political assassinations, riots, the terror of the Berlin Wall and Cuban Missile Crisis, and the Vietnam War. This piece pretty much defined the term "Sun Jazz," which was used to describe the corps' bright and cheery jazz style. Like other tunes of its ilk, it had lots of solo breaks, sectional features and short outbursts of screaming rhythmic figures that kept the ears of the audience members fully perked. "Aquarius" from Galt McDermott's 1967 musical "Hair" was a huge hit when released as a single later in the decade. A chorale rendition of the melody ended with a drill formation reflecting the astrological flavor of the lyrics, with the drums in a half moon, a large planetary form absorbing a smaller sphere and the color guard appearing as the rings of Saturn. A percussion break featuring the wail of a siren brought about the horn line to form the outline of a bomb, with the guard creating the international symbol for "No" through and around it. This form then evolved into a mushroom cloud, reflecting on the concerns of the Cuban Missile Crisis at the beginning of the decade and the Vietnam War toward the end. Brass players coalesced into a tight block surrounded by flags and began to shout as if rioting. Some of the color guard members picked up protest signs, while opposing forces picked up billy clubs. At the end, 10 memorial crosses appeared. Another statement of the siren brought the horns to a stop, facing backward, as the guard slowly lifted up 28 pieces of fabric off the ground to reveal the shape of Washington D.C.'s Vietnam Veterans Memorial Wall. Smith's "Requiem" provided the backdrop for a young girl to place a bouquet of flowers at one of the crosses, then walk up to the wall, which was quivering as if alive, and take from within it a white balloon of remembrance. As the balloon was released, it was joined by several more from the front sideline. 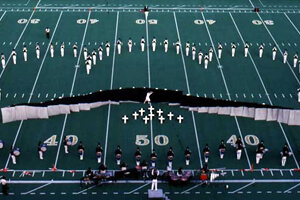 (This piece reappeared in 2011 in the middle of Madison Scouts' "New York Morning.") It's safe to say that the tears emoted by the young girl were duplicated by many in the audience.